Hamlet is a theatrical film based on the famous drama by William Shakespeare. It was directed by and stars Kenneth Branagh as the star-crossed Prince of Denmark. 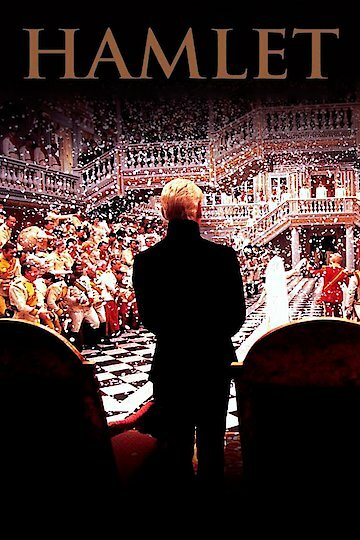 Branagh used the text of the original Shakespeare almost word for word but did update the location to a 19th-century setting. Hamlet is the tale of the Prince of Denmark, who returns home from school when he learns of his father's passing. Upon returning home, Hamlet discovers his mother, Queen Gertrude, has already remarried. This infuriates Hamlet as he feels this is a disloyalty to his dead father. Hamlet further discovers that her new husband is none other than his uncle, Claudius. Overcome with grief and anger, Hamlet teeters on the edge of madness, until he is visited by the ghost of his father. The ghost tells Hamlet that his death was a murder perpetrated by Claudius in an attempt to grab power. The ghost asks Hamlet to help him find peace by avenging the death and revealing the treachery to all. Hamlet discovers a new purpose to his life and dedicates all his resources to fixing this terrible deed. What follows is a tale of intrigue and secrets where Claudius does everything in his power to keep the crime from being revealed and Hamlet tries to find a way to expose the treachery of his uncle before he can be silenced. While the plot is relatively straightforward, the movie is actually a complicated network of interpersonal relationships, all of which will come to be strained as Hamlet seeks revenge. Hamlet's fiancee, Ophelia, will be tested as her brother and father are both extremely loyal to Caludius. Gertrude will try to confront her son's erratic behavior, all the while in the dark about the true nature of Claudius and the death of her first husband. These relationships add dimensions to the plot that will keep you guessing until the final scene. Hamlet is currently available to watch and stream, buy on demand at Vudu, FandangoNow, iTunes online.